Keep your stomach muscles lifted up and in toward your spine and up under your ribcage. This should be an internal lively sensation happening by zipping your abdominal muscles from your pubic bone up to the navel and then up under the ribcage. One of the best Pilates exercise instructions is to keep your shoulders down when you do this. This can be achieved by lifting your chest, which automatically helps to set the shoulders down and in place. It’s important that you keep the natural curve in your lumbar spine (lower back) when learning the Pilates exercise instructions for all movements. If you are lying on a mat, feel the back of your head, shoulders, middle ribs, hips, and tailbone in contact with the mat. In some cases you will work with the spine flat but only when the head is lifted. When doing any of the Pilates side kicks sequence this is the main exercise instructions Pilates principle that you should focus on. When lying you can rest your head on your bottom arm on the floor or be lifted up on the bottom elbow for more waist work and extension. Feel your hips stacked over each other and shoulder over shoulder with a long waist and your abdominal muscles tightened. Your legs are long and piked slightly forward at the waist for balance. 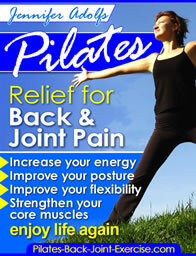 In some Pilates exercises you may flex the spine or bend forward at the waist. Imagine yourself like a capital letter "C" arcing from your head to tailbone over a giant ball, and you don’t want to squeeze it flat. To find the right spot for your shoulders using Pilates principles, extend your arms out to the sides, then lower them and imagine your shoulders are still out where your fingertips were. Another technique is to lift your chest, this will automatically put your shoulders in place. This will also help to prevent rounding your shoulders. Whenever you lift your head for a Pilates exercise instructions, the work should come from your abdominal muscles to support the head in this position. “Float” your head, nodding your chin about a fist length from your chest, folding just under the chest to support the head from your abdomen muscles. Lift the chest more as you rise to activate the abdominal muscles even more. Inhale deeply through your nose, feeling your ribcage expand out to the sides. Feel like you are breathing into your upper back laterally. Then exhale through your mouth, feeling your lower abdomen contract or get smaller like a balloon deflating. Breathing is the key for your exercise instructions Pilates to make your movements fluid and efficient. See these and other Exercise Instructions Pilates in the new revised ebook along with over 50 pictures and descriptions of the classics.